Statistics Netherlands published the annual road fatalities this morning and the fact that “cycling is deadlier than driving” made all the headlines. In absolute figures the scale tipped indeed, as experts expected for quite some time now. The figure for motorists had been dropping for years and the figure for cycling had been steady. The fact that the population is growing and that the Dutch cycle more distance per person are the main reasons, but two other facts are striking: two-thirds of the cycle deaths are people over 65 years of age, while they only ride 3% of the total distance and the number of casualties on e-bikes almost doubled in one year, making the deaths on the e-bike a quarter of the total cycle fatalities. But the figure only increased for men, fewer women died on an e-bike. The death toll for men on an e-bike went from 20 in 2016 to 38 in 2017. Furthermore, a staggering 31 of these 38 men were over the age of 65. Statistics Netherlands does not go into the causes of the crashes but the fact that the Dutch cycle so incredibly much is an important factor. “If you consider the growing cycled distance and the number of deaths and injuries, then you must conclude that cycling is in fact becoming safer”, said Peter van der Knaap, director of the Institute for Road Safety Research (SWOV) in the Volkskrant. In that same newspaper the Cyclists’ Union also wants to emphasise that they regret these grim figures. Spokesperson Jaap Kamminga: “Naturally every road death is one too many. But when you look at how much more we have been cycling – especially the elderly – then we must congratulate ourselves in the Netherlands. Cycling is healthy, we must continue to keep stimulating cycling.” Rob Stomphorst of the organisation VVN (Safe Traffic Netherlands) also focuses on the elderly on e-bikes. VVN calls on the cycle shops to better inform this age group about the differences in riding an e-bike. “Because of the e-bike the elderly can prolong the number of years they can keep cycling. But they should learn how to do that in the right way.” He said in Trouw. Most accidents take place without involvement of other road users, VVN says. While people are mounting or dismounting the e-bike or when they misjudge a road turn. The Cyclists’ Union stresses that most deaths are still caused by cars crashing into people cycling. “That is why it is important to separate motor traffic from cycling. Where that is not possible, the speeds must come down. The Cyclists’ Union advocates a speed limit of 30km/h for all road users in the built-up areas.” said Martijn van Es of the Cyclists’ Union, also in Trouw. The Union would like road managers to improve the cycling infrastructure; better surfaces, fewer bollards and wider cycleways. The elderly should also get lessons in riding e-bikes safely. No Dutch road safety organisation advocates cycle helmets, only SWOV is somewhat favourable to helmets for e-bikes. But even SWOV acknowledges that the benefit of a helmet obligation is marginal. Investigations show it could make a possible difference of zero to five deaths per year. When cars crash with people cycling the causes are drunk driving, speeding and distractions caused by the mobile phone, says mr Stomphorst of VVN. He feels that smart phone use causing a crash is especially increasing. People overestimate their capabilities and feel they can look at their phone whenever they receive a notification, even while they are driving. Human error is the cause for 90% of all traffic deaths in the Netherlands. Statistics Netherlands compared the distance cycled per person per day in 2016 with the number of fatalities in 2017 per age group. This picture makes very clear there should be extra attention to the over 65-year-olds and their increased risk when cycling. Although the cycle deaths increased, the total number of road deaths (613) decreased with 16, compared to 2016. Earlier this month, the European Commission announced that The Netherlands is in the top three of safest countries in Europe, after Sweden and the UK when you look at fatalities per one million inhabitants (S 25, UK 27, NL 31). All three are well below the EU average of 49 road fatalities per one million inhabitants. Considering how vulnerable people are when cycling, and comparing the cycle figures of the other countries, then that ranking is an achievement the Dutch can be very proud of. I dont get this report at all more deaths =safer cycling =utter rubbish.cyclists never crash into vehicles =uttter rubbish .putting bikes onto pavements =more incidents with the waking public thers no law on speed limits for bikes . Statistics are not always easy to understand, but when more people cycle more distance it can be true that even while the number of deaths increases the number of deaths per ridden kilometre is actually decreasing. 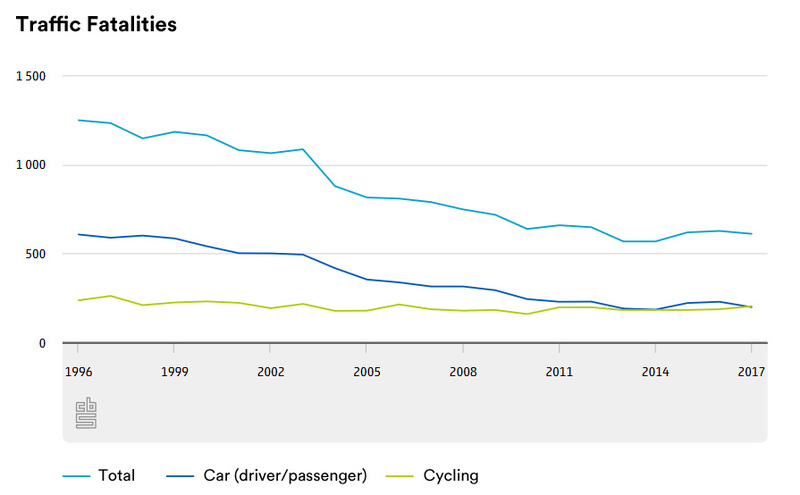 So yes, that means that even with an increased death toll the cycling is actually becoming safer in the Netherlands. I don’t understand what you mean with your other two remarks. Thank you Mark for an excellent and comprehensive article. 1) What is the progress with getting mopeds off bike infrastructure in Amsterdam (and elsewhere)? 2) Is training in ebike use available? 3) Any idea as to why most of the fatalities are to men (is it not true that women do more riding than men)? On a macro scale though, could the increased riding by the elderly be adding more years of life across the population, through better health, than the increased level of fatalities is taking away? There was this research about population health a decade or so ago. Comparing the Dutch with the British. All very similar respondents: bad diet, smoking, drinking, yadayada. Yet, the Dutch were inexplicably healthier. There was only one variable the researchers could not correct for: riding a bicycle. IIRC average life expectancy in NL and UK is about the same. (My guess is that health benefits from lots of cycling mask the impacts of the Dutch high-calorie diet and high levels of cigarette smoking). But what’s different is that the Dutch are actively mobile until nearly the end of their lives, unlike the British (and most of the “developed world”). The adage “It’s not the years in your life, it’s the life in your years” only becomes personally obvious to most people when they reach their mid fifties and their body starts to show the inevitable signs of wear and tear and ageing. The “trick” is to stay actively mobile into your eighties, which is almost impossible to achieve outaide of the NL without a conscious disciplined effort, due to the fact our road system is geared to be car-centric, which is anathema to actual and perceived safe and pleasant cycling and walking conditions. I have almost reached my mid fifties, I am 53 now. To stay healthy into my eighties and because we don’t travel far outside our home town I sold our car. Now, everything is done by bicycle. i have an ebike. it gives me about 3.5 mph faster speed on open road sections with less effort on my part and makes starting from a dead stop easier and quicker and that’s it. Have you seen the piece in either de Volkskrant or het Noord-Hollands Dagblad (I was at my parent’s today and they have both…) by an bike expert on e-bikes? He said that new bikes started to get a more sporty bike geometry about 15 years ago and that e-bikes, at least most of them, mindlessly copied that same geometry, even though elderly people generally prefer to sit more upright – but by adjusting the handlebars to do so, they put less weight on them, making the steering behaviour of the bike more ‘nervous’. According to him, that is what causes many accidents with older folks and e-bikes. Any thoughts…? Tricycle could be a coming fashion for elderly! I’m visiting Netherlands and I’m cycling a lot in my road bike. Its a joy to ride here. I can say this as I come from India where there is no road driving sense. And more so, the cars are contemptuous of the cyclists. But I must say, u was alarmed to find usage of mobile phones and texting by cyclists even when crossing signal intersection. The separate lanes for cyclists may look safer, but there are slight obstruction which can trip the bike and result in head injuries. And here helmet is not mandatory for cyclists either. Head injuries cause most fatalities. Head injuries per se are not the cause of the vast majority of cyclist, or motorist or pedestrian, cyclist of other similarly caused fatalities, brain injuries are. Given that the styrofoam hat style many call a bicycle helmet which is what I assume you are promoting has zero ability to prevent brain injury and is a likely cause of some brain injuries that occur at higher speed impacts the fact that there is relatively very few Dutch cyclists who wear styrofoam hats has a positive influence on the fact that per km ridden Holland has one of the lowest rates of bicyclist injuries and or deaths in the world. Lets not loose sight of the broader picture, life rarely has simple answers to complex phenomena, read ISBN: 978-1-60456-288-0 for further evidence. Bear in mind, Dutch roads are the safest in the world. More people cycling = safer roads. Dutch ‘Roads’ are not the safest in the world, Dutch ‘cycling infrastructure’ is, these are not roads and indeed the majority of cycling deaths occur when infra junctions with roads/motorists. KSI of all road users per billion mile is worse in NL than the UK by a significant margin, by definition of the huge bicycle use in NL this actually makes Dutch roads not that great in terms of deaths or serious injury risk. The ignorance of the problem of e-bikes just goes on and on, blowing the trumpet and yet blatantly ignoring the fact that by age group/e-bike use those using e-bikes in very large numbers (over 50% in the over 60s sectors) they have bucked the downward trend of deaths of people on bikes in all the other age groups. Why is there ignorance of the facts, why will people not acknowledge the obvious downsides to allowing untrained people particularly the elderly to go at speeds they simply are not used to going at without ever having to pedal which generally restricts your speed naturally. This is precisely why mopeds/motorcycles are problematic KSI wise and whilst I support e=bike use for mobility the speeds allowable are simply too fast for the majority of the users and the environment/infra doesn’t support the top speeds either, certainly not in urban environments. EU-legal e-bikes aren’t what you describe, though – assist cuts out at 25 km/h (15.5 mph), and it’s pedal assist only, throttles are banned. Where did you find the statistics proving dead elderly cyclists were not used to the speed of an ebike? What about mode share between car and bicycle? Does that change over the last year? That depends on where you look. For the entire country it has been more or less stable for years, but in the cities the mode share for cycling increased a lot, while in the countryside it decreased. More on those figures in this earlier blog post. It’s a unique situation the Netherlands are in. And these numbers are a direct consequence of the ageing population and the rise in popularity of ebikes. I wonder if perhaps a slower ebike is a better alternative for the elderly. 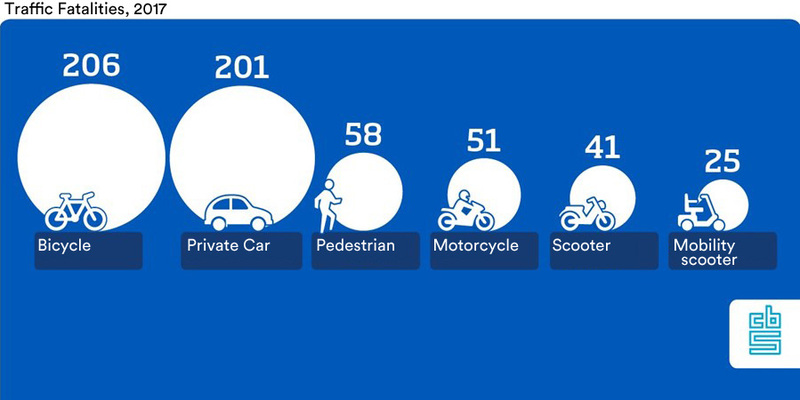 Most of the Dutch cycle accidents don’t even involve other traffic. E-bikes and the elderly seem to be the cause of most of the increase in cycling accidents reading the Dutch papers. Mobile phones, speeding, drink and drug driving – human error still biggest cause with Cars – I still don’t understand why there isn’t more being done to clamp down on these things, the supposed errors are conscious decisions by grown ups to break the law, and if they know they can get away with it, they will keep doing it. There’s far too much mollycoddling of drivers going on. It’s very pleasing that infra is considered so much in NL to prevent and mitigate injury and death, but it also has to include the responsibility drivers should have that comes with a licence. Living in NL, it’s lovely that most drivers are more patient than in the UK and that residents care more about seeing kids play safely on the street than parking and 20mph being too slow – they even have 15kph limits here! stay in 1st gear!. But you do still get boy racers and moms in cars double parking outside schools, there are a minority of assholes that spoil it for the rest, but I don’t see anyone depriving them of their licence, even after they kill someone, same as in the UK. Justice turns a blind eye to death by car. Very interesting. Thank you – and the officials at SWOV and Fietsersbond – for the nuanced explanation. The difference in consideration couldn’t be more striking in Australia where the equivalents of SWOV, on hearing the news that 2/3 of Dutch cyclists killed are over 65 years old, go straight to “HELMETS!” and accuse the Dutch of being a bunch of uncaring Libertarians prepared to sacrifice their elderly so they don’t get helmet-hair. 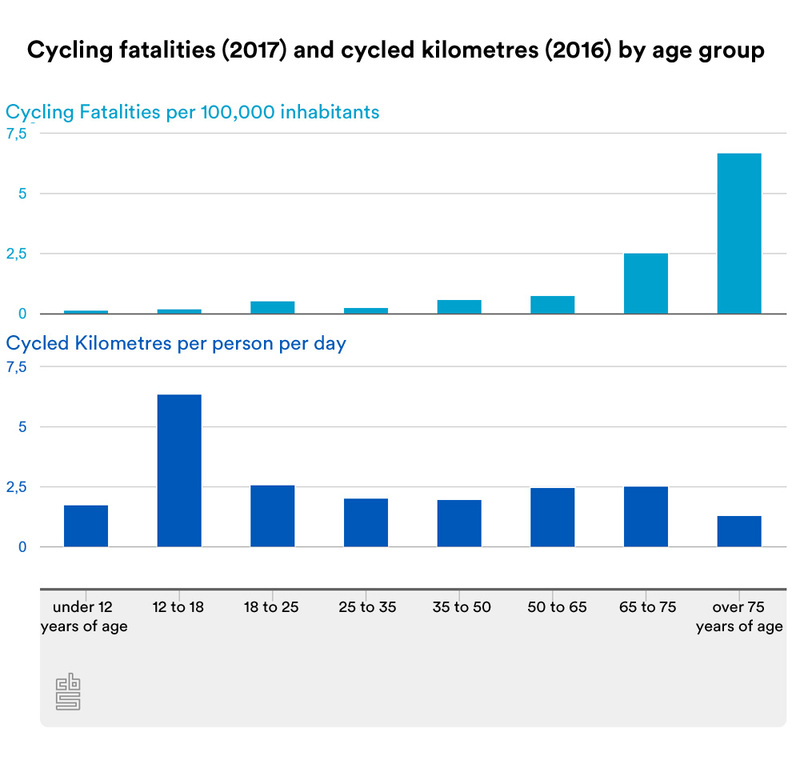 The Australian equivalent of SWOV should look at the fatality rate of the younger cyclist, let’s say age 30-45, and compare the Dutch figures with the Australian. While taking in consideration that we don’t use helmets and have segregated infrastructure and Australia not. And then they should consider if it is the helmet or the infrastructure that prevents fatalities. For the over 75s any fall is dangerous, and that is clearly visible in these statistics. When an older person’s balance gets a bit less certain, getting on and off a bike (especially one without a low stepover) can risk a fall. When their eyesight and their reaction times get a bit worse, an ebike going faster than they could bike on their own can increase the risk of bumping a bollard or anything else; and a slight bump that a younger person can easily compensate for or recover from, can be a serious fall for an elderly person. 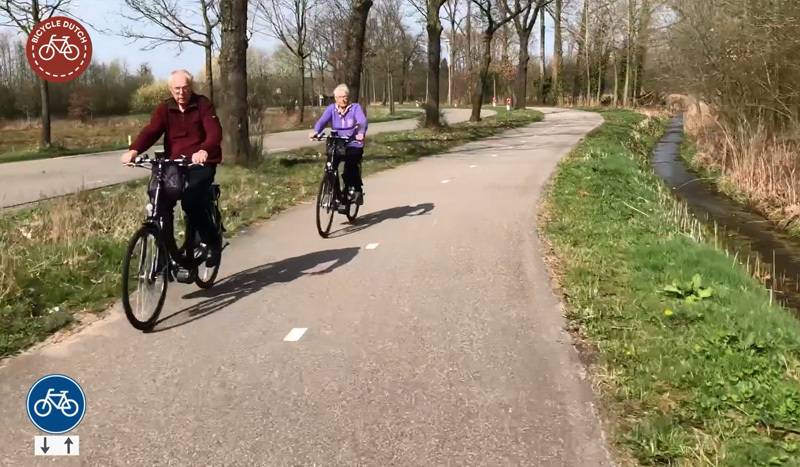 On the other hand, when cycling is so safe and easy that lots of elderly people continue to stay active in this way, that is very good for their health and wellbeing in general. If grandpa trips while trying to get off his bike, he falls just as hard as when he trips over a chestnut on the sidewalk in autumn (my mom broke her hip that way, and it was the beginning of the end for her), or falls from a kitchen step trying to reach down something from the top cupboard. In all those cases, it’s the fall that causes the damage and possible death, but in the first case it counts as a traffic accident, while the other cases contribute to the number of deaths from falling in and around the house. The more elderly people continue to live active and fullfilling lives, out and about whenever they want, instead of stuck at home waiting for someone to visit or take them on a drive, the more such falls will occur while actively moving. I understand the need to make active travel as safe as possible, for the elderly as well as for everyone else, e.g. by removing unnecessary bollards and providing ebike training for any elderly purchasers, and the trainer* can advise them about the statistics as well as helmets and hip pads at that time; maybe make a speedometer mandatory on ebikes – without one it’s easy to go faster than you think; and let’s continue to develop extra stable low-instep ebikes too. * Maybe something to include in the pré-pension training many employers offer their about-to-retire employees? And include an option to exchange an oldfashioned gent’s bike, with the high bar, for a low-instep one at a good price? But I don’t think discouraging active travel by promoting helmets in general, or discouraging elderly people from riding a bicycle is an acceptable solution, even though it would bring down the bicycle death numbers. The UK’s pride in being safer than the Dutch, while having chased most of their vulnerable road users off the roads, seems a very misplaced “apples and oranges” comparison to me. But announcing you stop bicycling is like one foot in your coffin already. I don’t think I can really transfer the feeling to those outside of Dutch bicycling culture. Dutch people will remember hearing the news about grandparents, relatives etc. about stopping bicycling vividly in many cases. Mind you, often a Dutch bicyclist has difficulty walking before they have difficulty bicycling. Giving up your bike is stepping into a phase of your life where you are depending on others to get around and survive. Now picture personal dramas of individuals in bicycle sheds around the country silently saying good bye to their bike forever. Are you surprised the e-bike is a success with them? It is like prolonging your life! A poignant story. A similar thing happens in Australia but only when people are told by their doctor they can no longer drive, and to make it worse hardly any Austalians over 65 still ride a bicycle, so it’s not consider a mode of transport they can switch to. Not that they’d want to with our roads that are too scary for cycling at any age except the young.and the brave. Is it uncommon for Dutch people who can no longer ride in two wheels to get a three-wheeler? Yep. My mother (Dutch) is 80 years old and fell off her e-bike almost standing still. It was just not the bike for her. Next week she is buying an tricycle for adults. Mobility is very important. 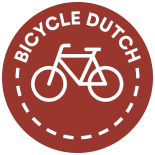 This entry was posted on 25 April 2018 by Bicycle Dutch in Original posts and tagged figures, road safety.